The AAJA mentoring and leadership program Voices is currently accepting applications for students and mentors. Selected participants will take part in a multimedia convention news project that will be held at the annual AAJA convention in San Francisco from August 10-16. Students will have travel and accommodation covered during the program. Voices is now marking its 25th anniversary as a premiere training program for talented young journalists and mid-career journalists interested in newsroom leadership. Read more about how Voices has launched the careers of students. Application deadline to apply is April 12, 2015. For any questions, please contact Voices director Ruth Liao at ruthlessliao@gmail.com. Paid journalism internships available this summer through SPJ’s Hawaii chapter. Print, online, and broadcast journalism and public relations internships are being offered in summer 2012 through the Hawaii chapter of the Society of Professional Journalists. Who is eligible: Preference is given to applicants who are Hawaii residents enrolled in a college or university and who went to high school in Hawaii. Preference is also given to students enrolled in a college or university in Hawaii. Applicants will be considered if they will have completed their sophomore year of college by June 2012. Recent graduates are also eligible. Visit www.hawaiispj.org to fill out an online application form. Write a cover letter introducing yourself and explaining why you want an internship, list your relevant coursework or news media experience, and include three references with their contact information. Include samples of your news media work. You can send these as URL links; pdfs,, Word, or .txt files; wmv files for video; or wav files for audio. Send all materials labeled with your name to spjinterns@gmail.com. You will be contacted directly by the news media if they wish to interview you for an internship. If you are a candidate, you will be contacted by April 1. For more information, contact SPJ’s Craig DeSilva at (808) 282-1038 or at cdesilva@hotmail.com. Join us in a joint mixer with the Hawaii chapter of the Public Relations Society of America. You can expect up to 100 public relations professionals. This is an excellent opportunity to network with media and P.R. professionals in Hawaii. Bring a great attitude and some business cards! Guests will be treated to DJ music, heavy pupus, drinks and swag bags with Ala Moana Center goodies, including a mystery gift card worth anywhere from $10 to $500. Fashion stylists will also be on hand showcasing the hottest must-have pieces for spring. The event is also a kick off for the mall’s Shop a Lea event. You MUST RSVP to Gene Park by March 15, Tuesday. The AAJA chapter has up to 50 spots available, so we do need a headcount. Please RSVP by either e-mailing Gene, gpark@staradvertiser.com, or tweeting him @GenePark, or on Facebook. Another important note: We will only accept RSVPs from current members only. If you haven’t joined AAJA yet, go here. High school juniors with a passion for journalism have until Feb. 15, to apply for the annual Al Neuharth Free Spirit Scholarship and Journalism Conference, July 9-14, 2011, at the Newseum in Washington, D.C. Eligibility is limited to students who are interested in journalism careers, who demonstrate qualities of “free spirit” and who are high school juniors in the 2010-2011 academic year. Online applications and more information are available at www.freespirit.org. complete the five-day workshop will be awarded $1,000 scholarships that will be paid to each student’s college or university of choice in the fall of 2012. The conference and scholarships are designed to inspire and encourage students to pursue journalism, to network with one another and to develop lifelong associations. The conference, hosted by Al Neuharth, includes full access to the Newseum, interaction with media leaders and journalists, hands-on training, tours of Washington’s landmarks, plus fun and fellowship. The Free Spirit program began in 1999 and is funded by the Freedom Forum to honor Neuharth, the founder of the Freedom Forum, Newseum and USA TODAY. 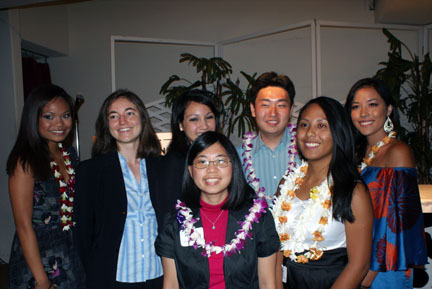 Pictured here are the interns for the Society of Professional Journalists Hawaii's 2010 internship program. Print, online and broadcast journalism and public relations internships are being offered in the summer of 2011 through the Hawaii chapter of the Society of Professional Journalists. Who is eligible: Preference is given to applicants who are Hawaii residents enrolled in a college or university and who went to high school in Hawaii. Preference is also given to students enrolled in a college or university in Hawaii. Applicants will be considered if they will have completed their sophomore year of college by June 2011. Recent graduates are also eligible. Write a cover letter introducing yourself, explaining why you want an internship, listing your relevant coursework or news media experience, and three references with their contact information. Include examples of your news media work. You can send these as url links; pdfs, Word or .txt files for articles; wmv files for video; or wav files for audio. You will be contacted directly by the news media if they wish to interview you for an internship. If you are a candidate, you will be contacted by March 31. UNITY: Journalists of Color Inc.
© 2019 AAJA Hawaii. All Rights Reserved.